Aaron Lewis has apologized for botching the lyrics of "The Star-Spangled Banner" during his performance before Game 5 of the World Series. 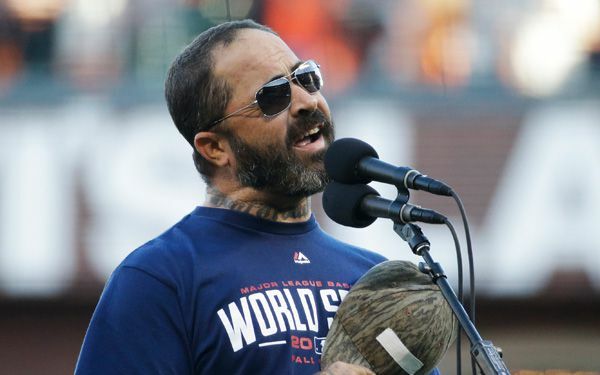 The lead singer of the metal band Staind turned country singer published a note on his website Monday after stumbling during his rendition of the national anthem the night before in San Francisco. After starting with "O say can you see by the dawn's early light, what so proudly we hailed," Lewis diverted from the lyrics. Instead of singing "at the twilight's last gleaming" he sang "were so gallantly streaming," words that appear later in the song. Why was he nerves to sing the National Anthem? I think that he did that because he was scared to sing a song that he didn't or usually singed. I think that its not that big of a deal because he apologizes after messing up we all make mistakes. Forgiveness is necessary at this point people mess up forgive and forget I think he handled saying the wrong words to the best of his ability. 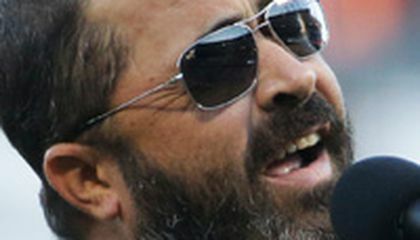 This article is mostly about Aaron Lewis messing about the Star Spangled Banner before the 5th game of the World sires. During the song he would say the wrong words and finally he said i'm sorry to the audience and we walked off the field. He kept on saying that he was sorry after the game and he kept on saying how much he loves America. Aaron Lewis was the lead singer of the Star Spangled Banner and he forgot the lyrics to the song he asked for forgiveness and he apologized. I think he should just do it over because when you are standing in front of thousands of baseball fans, it will be hard not to mess up. I would've messed up so don't blame him for trying. Why would he sing it if he did not know all the words to it? I wounder what the people in his band said about him. At least he said sorry and ask for the nations forgiveness. he should of studied more. if he would of done that, he would have a better preformance. i wouldnt judge him because everybody makes mistakes. nobody is perfect. I think Its terrible if you're on national tv & cant remember the national anthem or the "Star-Spangled banner." I think this because its an important event that happened in life, but there's others in the world, & people that I've met that don't know 1 word to this national Anthem. I will be scared to see that song at a game with all them people there. I like that song doe. I don't care about the world series because Pittsburgh is not in it.